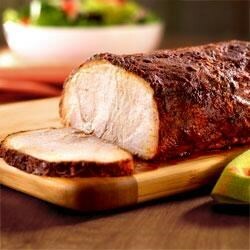 "Give your family's everyday pork loin recipe a major flavor boost with a simple homemade Adobo rub. Just mix GOYA® Adobo All-Purpose Seasoning with Pepper with chili powder, cumin, brown sugar, cinnamon, and a few tablespoons of olive oil. Rub over the pork, roast until golden brown, and prepare for the compliments to roll in!" I absolutely LOVED this! I didn't have cumin but used all the other ingredients as written. Incredible and will make this spicy dish again! Didn't change a thing. The rub was a perfect compliment for the pork tenderloin that was so tender and tasty. Will have again and again.